Trickbox TV provides TV studios in London for Mayoral election. 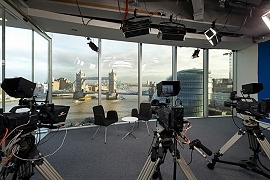 London, May 2016: Trickbox TV, the broadcast services provider, has provided TV studio facilities for interviews with the main candidates in the London Mayoral election. Mayoral candidates Sadiq Khan from Labour and Zac Goldsmith from the Conservatives have been in the spotlight, eager to campaign for each of their parties in the lead up to the election. Trickbox TV was able to provide studio facilities for interviews with both, alongside the three other main candidates, Green party’s Sian Berry, Lib Dem Caroline Pidgeon and UKIP’s Peter Whittle in Tower Bridge TV Studios, overlooking the iconic London backdrop and City Hall. In two broadcasts from the studio, Sadiq Khan and Zac Goldsmith were interviewed live on air. Trickbox TV also provided facilities for a full day's pre-recorded interview of these main five mayoral candidates, which formed a series of short election special broadcasts, which have been going out every night this week.